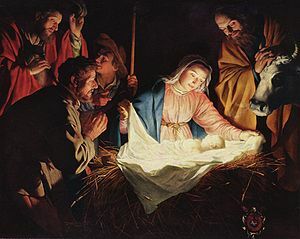 APOLOGETICA » Blog Archive » -Is Christmas Really a Pagan Holiday? Years ago when my children were still small I had a couple of visitors at the door on a Saturday before Christmas. The Christmas tree was up with presents all around it in preparation for the big day. The couple at the door explained that they did not celebrate Christmas since it was really a pagan holiday- Saturnalia –a old Roman celebration of their god Saturn on December 25. Is Christmas really a pagan celebration like the cultist couple believed? But a lot depends upon how you celebrate the holiday. If you are celebrating the birth of Saturn than it is still pagan for you and yours. If Santa Claus and his reindeer are the central focus of your celebration then the couple may have a point. If you are celebrating and remembering the birth of Jesus Christ then it is Christian no matter what day it is on. After all there is really no mention in the Bible what day it actually happened on. Since the shepherds were watching over their sheep in the fields on that first Christmas Eve then it had to have happened sometime between May and early October. « -The Supposed ‘Missing Years’ of Jesus?